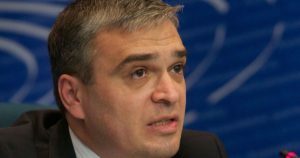 The Committee of Ministers of the Council of Europe has renewed its call on the Azerbaijani government to immediately release the jailed REAL Movement chairman Ilgar Mammadov. This demand was put forward in the European Human Rights Court’s (ECtHR) Resolution #144 on execution of the judgments related to Azerbaijan. The resolution reads that Article 46 of the European Convention grants an exclusive right to the Council of Europe Committee of Ministers to monitor the execution of the ECtHR judgments. The Committee of Ministers notes that Ilgar Mammadov still remains in prison for criticizing the government. The resolution reminds that the government’s obligation to abide by the judgments of the European Court is unconditional. The highest competent authorities of the respondent State must take all necessary measures to ensure without further delay Ilgar Mammadov’s release. According to the document, until Ilgar Mammadov is released, the situation with his case will be examined at all meetings of the Committee of Ministers.